This page is about a future product that has not yet been officially announced or released. Having launched the second-generation Canyon mid-size pickup truck in North America in late late 2014, we expect GMC to make a few small, but important updates to the 2016 Canyon. General Motors has already confirmed that the 2016 GMC Canyon and 2016 Chevy Colorado will offer the 2.8-liter Duramax engine. Officially known by engine code XLD28, the 2.8L Duramax diesel will be manufactured in Thailand. It has been available on the International-market Chevy Colorado since 2012. In the (International-market) 2014 Colorado, the engine makes 200 horsepower and 360 pound-feet of torque when mated to a six-speed automatic transmission. General Motors will likely add its new 8-speed automatic transmission to the 2016 Chevy Canyon. Whether or not the new gearbox will be made standard or optional across all Canyon trim levels and engine choices or just some, such as the flagship SLT, Denali, or Duramax diesel, however, is still unknown. Expect the new transmission to allow the midsize Canyon to be more responsive during acceleration while being able to attain slightly higher fuel economy in both city and highway driving conditions. 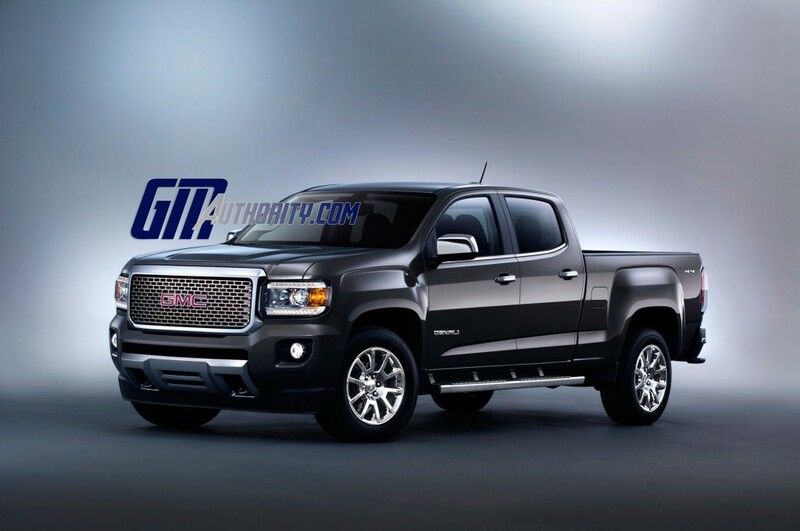 We also expect the 2016 GMC Canyon to be offered in the new Denali trim level. Like other GMC Denali vehicles, the Canyon Denali will increase the amount of chrome on the vehicle, while adding more interior equipment. Besides these rather obvious additions, we hope that GMC gives Canyon Denali other features, such as a unique engine (like the 4.3-liter LV3 V6) or the Magnetic Ride Control suspension system. To note, GMC will offer MRC on the 2016 Sierra Denali. If a Canyon Denali comes to market, expect it to have a starting price close to $40,000. The 2015 Canyon didn’t launch with a Work Truck trim level, instead only offered customers the base Canyon, SLE, and SLT models. However, given that the 2015 Colorado is offered in a work truck model, it is possible that the 2016 Canyon could get a similar trim level as well.